This there are recipe from my grandmother, I don't know this from malaysia is from cina, its the name Tong Sui. I like Tong Sui is mouth scrubber soup chinese beloved. There is many types on tap Sui. Some people cooks it by the way of a real simple. 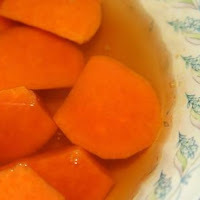 Sweet potato soup was very easy and makes it only require time 20 minutes. Sweet potato basically eaten by poor people. I remember when my old fellow tells that during second world war, safe people because there are sweet potato because easy to in planting and growing. Peel the skin off from the sweet potatoes and cut it into bit-sized chunks. I tie a knot on the pandan leaves so that I can easily remove it after the soup is cooked. Drop a piece of brown sugar slab into a pot of boiling water. I use three cups of water. I then just pour everything into the pot and boil it for 15 minutes. That's it -- sweet and simple. cara menyajikan membuat makanan kampung memiliki rasa dan bercita rasa tinggi, dan laku dijual dengan harga tinggi. begitu jugakah dengan orang kampung :)?